Well, I finally did it -opened my Etsy Shop ! I had some free time last night and got busy posting a couple of things. There are a few more things I need to add, but just have not had a chance since I have been adding a button to my blog. I will try to get to adding more items through the weekend. Last night I did get to finish something I told Emma I would do a LONG time ago...I felt bad because I had not gotten to it, and I promised her I would do this. So I cranked up the sewing machine last night to finish her pillow. 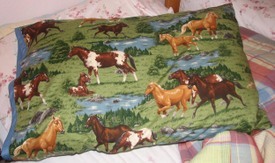 Her horse pillow. I am telling you that girl is crazy about horses! I have a lot to do today... meaning get out in our really cold weather.... yuck~!